Cisco’s Container Platform will work with SAP’s Data Hub to integrate large data sets that may be in public clouds such as Amazon Web Services, Hadoop, Microsoft or Google. Cisco today said it has teamed with SAP to make it easier for customers to manage high volumes of data from multi-cloud and distributed data center resources. The companies announced that Cisco’s Container Platform will work with SAP’s Data Hub to integrate large data sets that may be in public clouds, such as Amazon Web Services, Hadoop, Microsoft or Google, and integrate them with private cloud or enterprise apps such as SAP S/4 HANA. Cisco introduced its Kubernetes-based Container Platform in January and said it allows for self-service deployment and management of container clusters. SAP rolled out the Data Hub about a year ago, saying it provides visibility, orchestration and access to a broad range of data systems and assets while enabling the fast creation of powerful, organization-spanning data pipelines. A stand-alone Cisco Container Platform: An SAP-certified, software-only option for customers to install on their choice of on-premise infrastructure. Integrated Cisco Container Platform on Cisco HyperFlex: An SAP-certified software and hardware bundle for customers who want a preconfigured hyperconverged platform to quickly and easily run SAP Data Hub. The idea is to let customers place data where ever they want – in cloud services or locally in the data center and let legacy applications work in hybrid cloud environments without the need to lift and shift data, said Dave Cope, senior director of Cisco Cloud Platform & Solutions Group. This reduces complexity, helping customers quickly gain actionable insights and develop useful applications from their stored data. Indeed, the package promises to help customers manage a complex environment and remove the limitations of data silos, analysts said. "For large enterprise accounts that use SAP HANA and Cisco HyperFlex, or have SAP Data Hub, this announcement offers certified capabilities between the two vendors," Elliot said. This is about enabling enterprises that want to move more SAP workloads to the cloud. It enables customers to optimize data migration from a private to public cloud. For Cisco, the package continues the company’s strategy of developing products for the multi-cloud universe and supporting any of the cloud environments that work best for customers, Cope said. 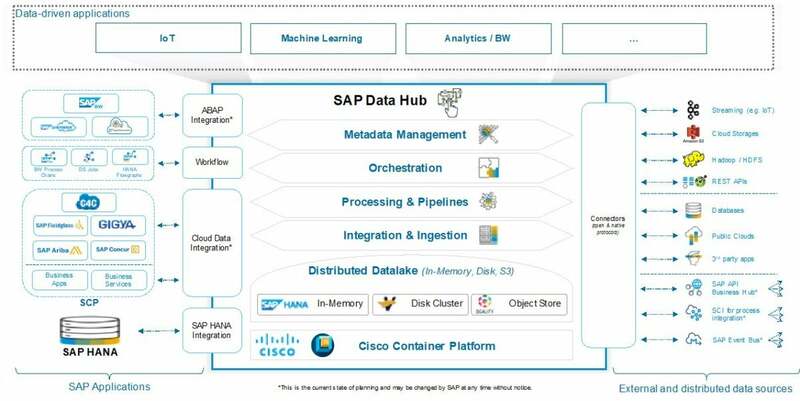 The SAP Data Hub on Cisco Container Platform will be available from Cisco in November 2018. It is expected to be available on the SAP App Center in Q1 2019. The SAP/Cisco package was introduced as part of a larger SAP announcement that included a new version of the Data Hub which featured a new interface and additional management tools.